I in turn see you as a fellow worker Mark. Showing him to be the Savior of those that bear his name. Keeping his nous proper for the Lord. 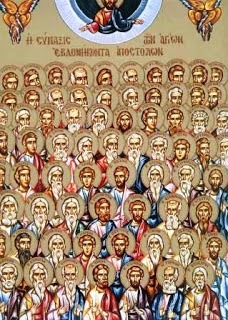 These Saints were numbered among the Seventy Apostles of the Lord. Tertius was the second bishop in succession after Saint Sosipater (Nov. 10; Apr. 29) in Iconium, where he converted many pagans to Christ through his words and deeds done in the power of the Holy Spirit. He was also the writer of the Apostle Paul's letter to the Romans, as we read in Romans 16:22, "I, Tertius, the one writing this letter, greet you in the Lord." Mark, also known as John (Acts: 12:12), was the nephew of Saint Barnabas (June 11) from his brother. It was in the house of his mother Maria that the persecuted disciples found shelter after the Ascension of the Lord. In 2 Timothy 4:11, written when the Apostle Paul was imprisoned in Rome, he says, "Only Luke is with me. Get Mark and bring him with you, because he is helpful to me in my ministry." That Mark went to Rome seems evident from Philemon 24, "Epaphras, my fellow prisoner in Christ Jesus, sends you greetings. And so do Mark, Aristarchus, Demas and Luke, my fellow workers," and Colossians 4:10, "My fellow prisoner Aristarchus sends you his greetings, as does Mark, the nephew of Barnabas. (You have received instructions about him; if he comes to you, welcome him.)" He went on to become Bishop of Apollonia, and through his preaching of the gospel, he banished the worship of the idols. Being also commemorated on September 27th, there he is said to have been Bishop of Byblos, who shadow alone was able to heal the sick. Justus, also called Joseph Barsabbas, was one of two candidates qualified to be chosen for the office of apostle after Judas Iscariot lost his apostleship when he betrayed Jesus and committed suicide. After the casting of lots he was not chosen, the lot instead favoring Matthias to be numbered with the remaining eleven apostles (Acts 1:21–26). He is also known as Jesus, and was the half-brother of Christ (as were James, Jude, and Simon) through Joseph's previous marriage to Salome. Justus went on to become Bishop of Eleutheropolis (known as Betaris at that time), and with his words and miracles he brought many unbelievers to the faith. Artemas was Bishop of the Lycian city of Lystra, where he foiled all the devices of the demons by the grace of Christ. These four Apostles struggled on behalf of piety, and after undergoing great temptations, they reposed in peace and delivered their souls into the hands of God.